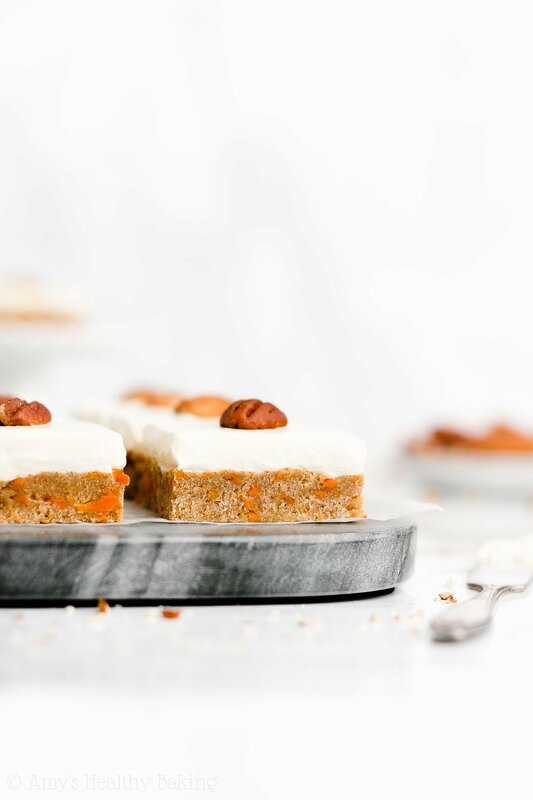 Learn how to make these soft and chewy carrot cake cookie bars from scratch! 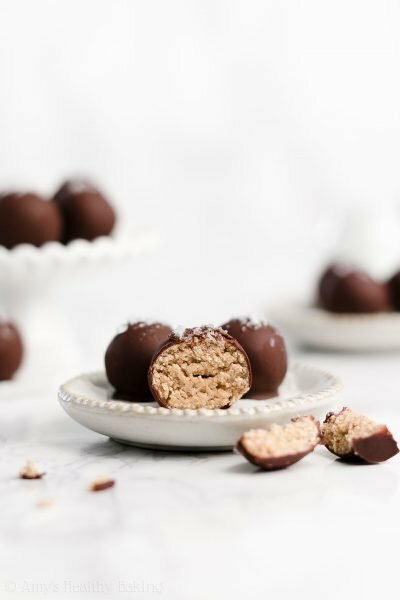 They’re much easier than you’d think and just 78 calories with no refined flour or sugar! 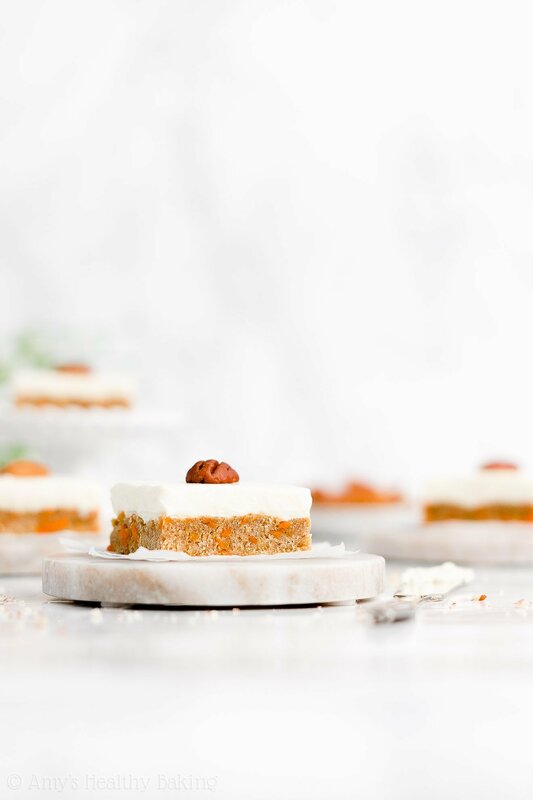 Perfect for Easter—or any day you’re craving carrot cake! During my senior year of high school, my mom’s cousin drove to Northern California with her significant other for an extended vacation. They ended up in our hometown shortly before Easter, so Mom invited them to join us for the holiday. Although we rarely did anything too extravagant, mainly dye hard boiled eggs and watch “It’s the Easter Beagle, Charlie Brown,” we planned a special dinner that year. Mom ordered a honey baked ham from a local spot in town, and we bought the ingredients for some simple homemade sides and a dessert. Always a baker, even back then, I picked out a carrot cake recipe to try from my favorite cookbook. It seemed to somewhat fit the holiday theme (Easter bunnies? carrots? ), and since everyone in my family had a pretty big sweet tooth, I started working on the full-sized cake bright and early on Easter morning. I carefully followed the recipe, measuring the flour and grating the carrots and gently mixing the batter by hand. After sneaking a quick taste from the bowl, I poured it into our large 9×13” cake pan, slid it in the oven, and set a timer. Just before our two guests arrived, I pulled out Mom’s electric hand mixer to whip up the cream cheese frosting. I spread the sweet, silky smooth frosting in a thick layer all over the top of my cooled carrot cake, and I set it on the counter alongside the ham, spinach salad, steamed asparagus, mashed potatoes, and bread rolls. I was basically the only one! Everyone else dolloped hefty amounts of the ham, sides, and bread onto their plates, except for my brother, so when the time for dessert rolled around, the four adults cut themselves the tiniest slivers imaginable of my cake. We ended up with almost a full pan left over! Which meant we continued to eat carrot cake every day for the rest of our spring break… Oops. 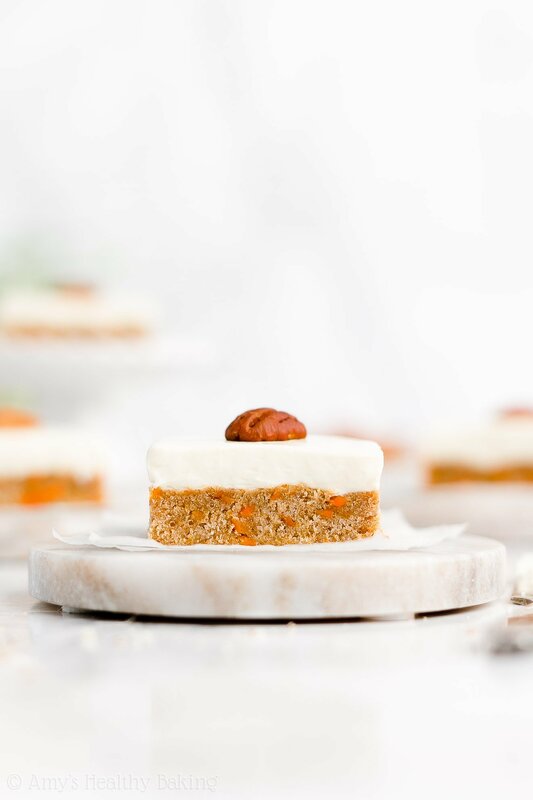 Even better, this healthy recipe contains no refined flour or sugar, unlike most traditional carrot cake recipes, and just 78 calories in each cookie bar! 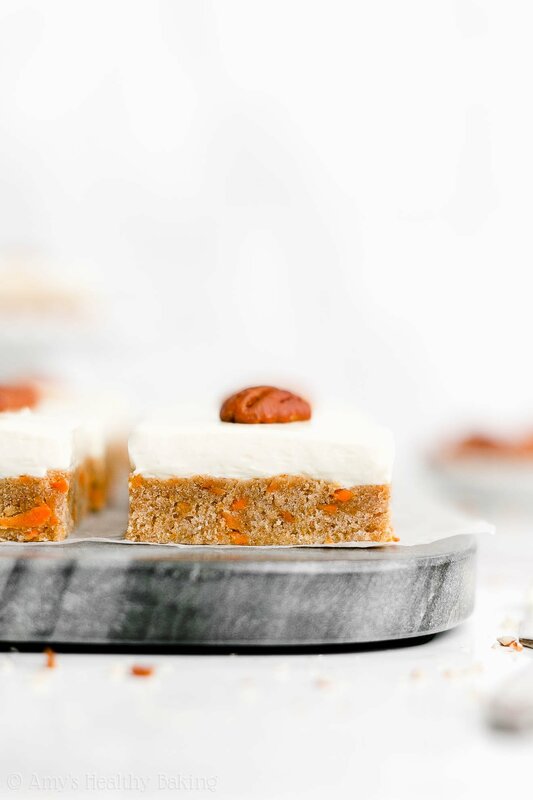 So let’s go over how to make these healthy carrot cake cookie bars! You’ll start with a combination of white whole wheat flour and a trio of spices: cinnamon, allspice, and nutmeg. I actually buy my favorite cinnamon online here! It tastes stronger and sweeter than other varieties, and it’s actually really affordable. I know it may be tempting to skip the allspice and nutmeg, but they add a lovely depth and richness to the flavor. I promise it’s worth using all three! Perhaps you’ve read through some of my recipes before and I now sound like a broken record… Or perhaps you’ve never heard me say this before. Either way, white whole wheat flour actually exists, and contrary to what it sounds like, it’s not a combination of white (aka all-purpose) flour and regular whole wheat flour! Instead, white whole wheat flour is made by finely grinding a special type of soft white wheat (hence the name! ), whereas regular whole wheat flour is made from a heartier variety of red wheat. They both have the same health benefits (like extra fiber! 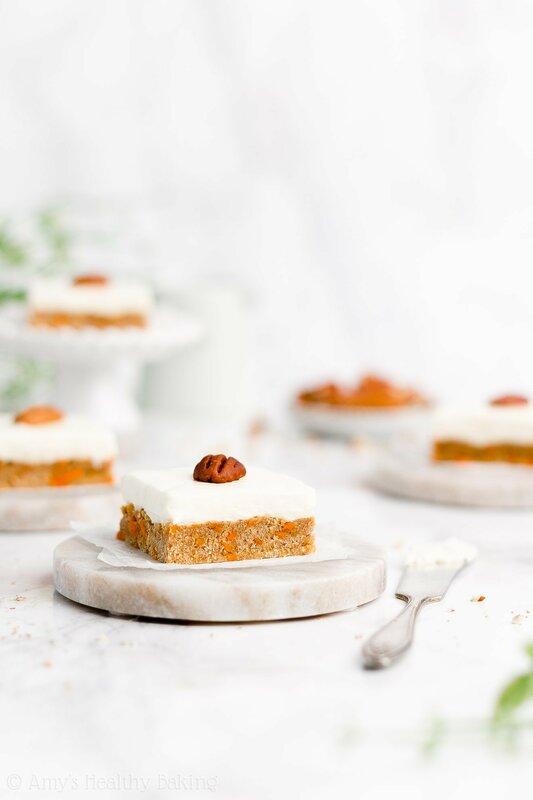 ), but white whole wheat flour has a lighter taste and texture… Which lets the soft and chewy texture and rich spice flavor of your healthy carrot cake cookie bars truly shine! Just remember, it’s extremely important to measure the flour correctly, using this method or a kitchen scale. (← That’s the one I own and love!) Too much flour will make your cookie bars dry or cakey, instead of incredibly moist and soft and chewy. It only takes a few extra moments to measure carefully, and it makes a huge difference in the texture! Hint: If you use a kitchen scale, that also means fewer dishes to wash, and that’s always a good thing! Right?? Unlike traditional recipes that use a full stick or two of butter, you only need 2 tablespoons for this one. 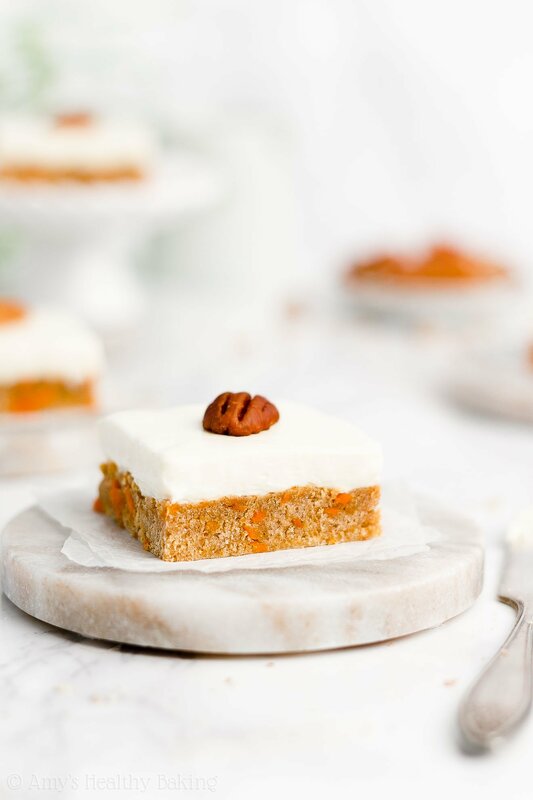 That really helps keep your healthy carrot cake cookie bars low fat and low calorie! Even better? You melt the butter, so you (a) don’t have to remember to set it out to soften ahead of time and (b) don’t need a mixer, just a whisk and fork! 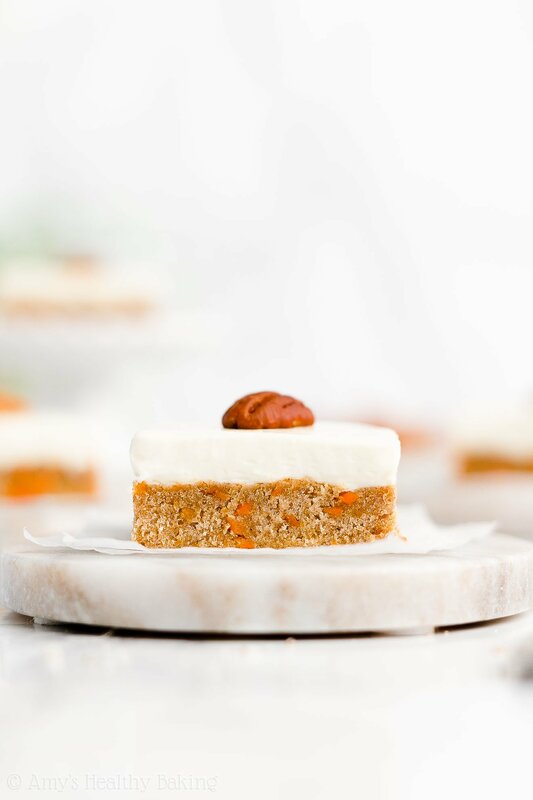 Then to make sure your healthy carrot cake cookie bars taste just as rich and buttery as traditional cookie recipes, you’ll use my (somewhat) secret ingredient… Extra vanilla extract! Vanilla enhances butter’s rich flavor, so by using a bit more than in traditional recipes, it makes your healthy cookie bars taste more rich and buttery, just without the extra calories! Such a great trick, right?? If you only used pure maple syrup, then you’d end up adding a lot of liquid to your cookie dough. All of that liquid would give your cookies the same texture as muffins or cake! Not the denser, chewier consistency as cookies. Yet if you scaled back and only added enough pure maple syrup to give your cookie dough the correct consistency, so your cookie bars turned out soft and chewy, then they wouldn’t nearly be sweet enough. They’d taste like muffins or bread rolls, not like sweet dessert treats! So that’s where the liquid stevia comes in! Stevia is a plant-based, no-calorie sweetener that contains nothing refined or artificial (aka it’s clean eating friendly!). It’s also highly concentrated. 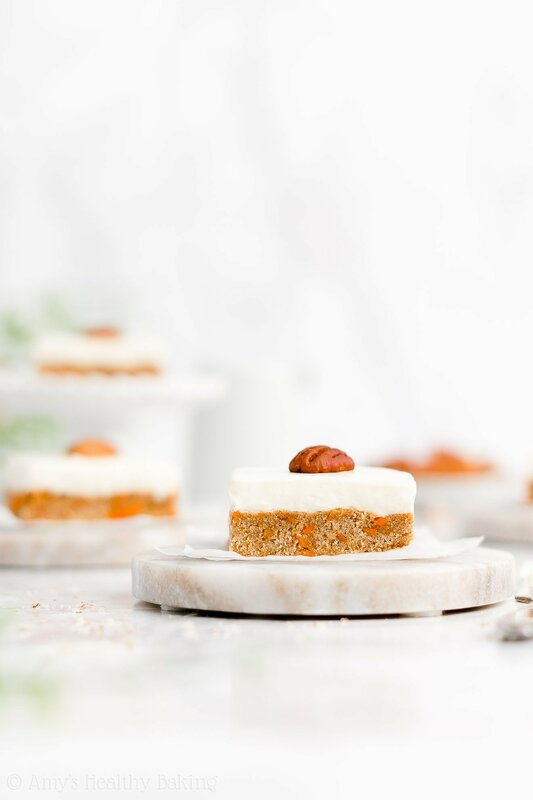 You just need 1 teaspoon for these healthy carrot cake cookie bars, which is the equivalent of nearly ½ cup of pure maple syrup! By using half pure maple syrup and half liquid stevia, your cookie bars have the correct texture and the correct sweetness level. That’s definitely a win-win in my book! Hint: Remember, pure maple syrup is the kind that comes directly from maple trees! It’s not the same thing as pancake syrup. The only ingredient on the bottle should be “pure maple syrup,” and you can generally find it in thin glass bottles or squat plastic jugs (like this!). Another Hint: I buy my stevia online here because that’s the cheapest price I’ve found! I love that particular one because I don’t notice the same aftertaste like in some other stevia products. You’ll use it in all of these recipes of mine, too! One more key ingredient… Freshly grated carrots! Yes, they must be freshly grated! Store-bought pre-shredded carrots (also called “matchstick” carrots) are thicker and drier, and they don’t soften properly while baking. (They’re also not as flavorful, in my opinion!) So please, pretty pretty please, take the time to grate your own! The cream cheese frosting! You’ll actually use a combination of Greek yogurt and light cream cheese, along with a little more stevia to sweeten it, and instant pudding mix. Yes, I know. Instant pudding mix? In frosting?? 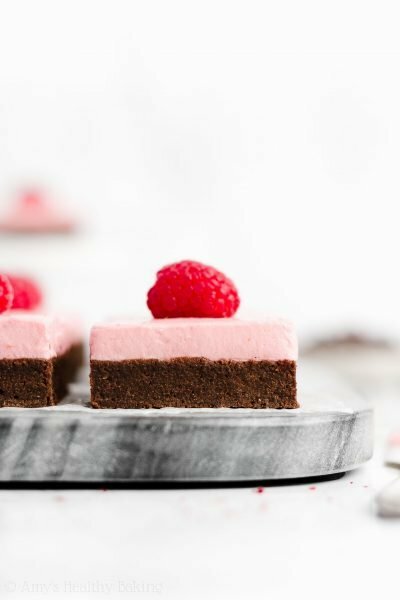 As crazy as it sounds, the instant pudding mix thickens the frosting, especially the Greek yogurt, so that this healthier cream cheese frosting turns out just as thick as regular buttercream frosting. 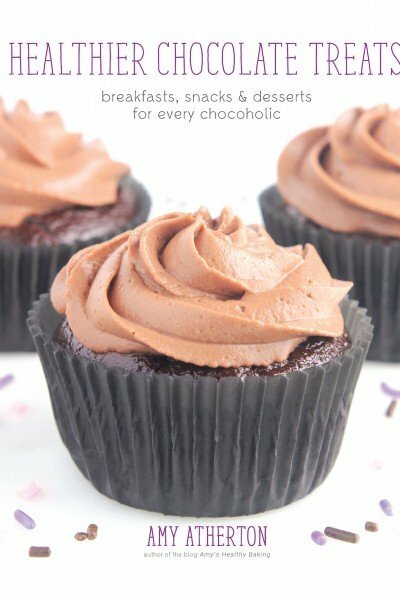 It’s a nifty trick I use, especially when I’m making frosting to pipe on top of cupcakes! Enjoy your delicious dessert! And when you make your own, remember to snap a picture and share it on Instagram using #amyshealthybaking and tagging @amyshealthybaking IN the photo itself! (That guarantees I’ll see your picture!) 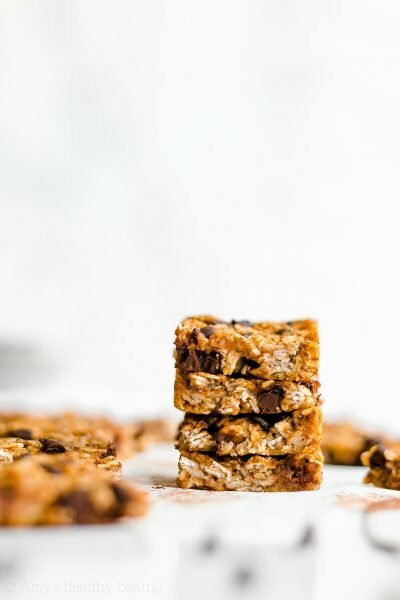 I’d love to see your healthy carrot cake cookie bars! 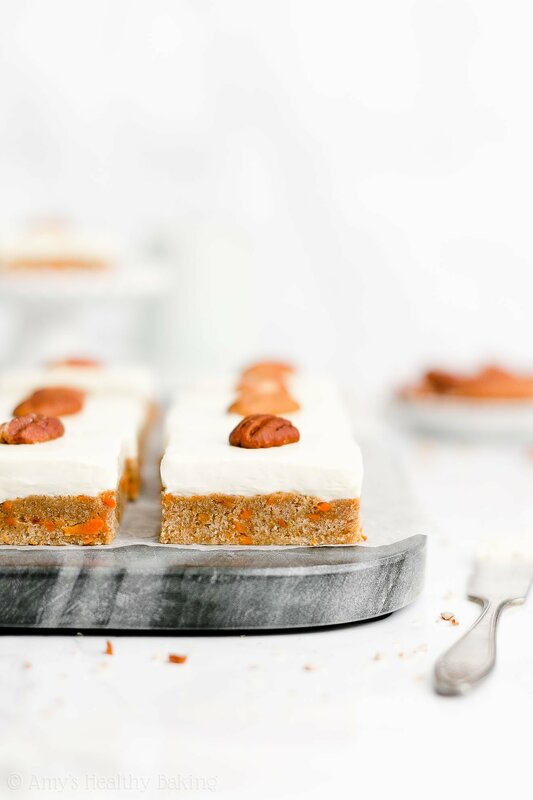 These soft and chewy cookie bars taste just like carrot cake! 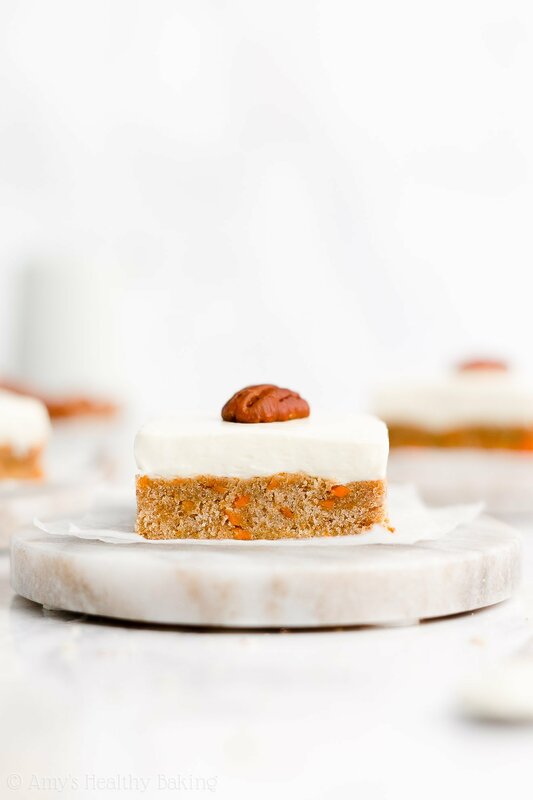 They have lots of sweet carrots and rich spices, and the smooth cream cheese frosting on top is the perfect finishing touch. Leftovers will keep for at least four days (if not longer!) if stored in an airtight container in the refrigerator. Preheat the oven to 325°F, and coat an 8”-square pan with nonstick cooking spray. To prepare the cookie bars, whisk together the flour, cinnamon, nutmeg, baking powder, and salt in a medium bowl. In a separate bowl, whisk together butter, egg white, vanilla, and liquid stevia. Stir in the maple syrup. Add in the flour mixture, stirring just until incorporated. Fold in the carrots. Using a spatula, gently press the cookie dough into the prepared pan in a thin, even layer. Bake at 325°F for 10-12 minutes or until the center feels firm to the touch. Cool completely to room temperature in the pan. While the cookie bars bake, prepare the frosting. Beat the Greek yogurt, cream cheese, instant pudding mix, and stevia together using an electric hand mixer or stand mixer for 2 minutes. Cover the bowl with foil, and chill for at least 2 hours. Once the cookie bars are completely cool, spread the frosting across the top. (I highly recommend an offset spatula like this to do so!) Slice them into 16 square bars. Notes: For the gluten-free option, use store-bought gluten-free flour blends (like this one!) and measure them like this. Be very careful when measuring the flour! Use this method or a kitchen scale. (← That’s the one I own and love!) Too much flour will make your cookie bars turn out dry or cakey, rather than soft and chewy. I highly recommend using the liquid stevia! I buy mine online here, and you’ll also use it in all of these recipes of mine. 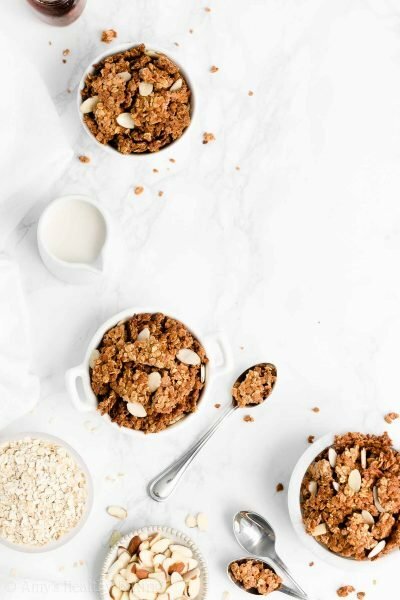 You cannot substitute additional pure maple syrup for the liquid stevia because the cookies require a precise balance of wet and dry ingredients. However, you may substitute ¾ cup (144g) coconut sugar (or brown sugar or granulated sugar, if you aren’t concerned about keeping these cookies clean eating friendly) for both the pure maple syrup and stevia in the cookie bars, but the cookies will appear “speckled” if using coconut sugar because it doesn’t dissolve as well. Neufchâtel cream cheese, Greek yogurt cream cheese, and fat-free cream cheese all work for the light cream cheese frosting. Regular full-fat cream cheese will also work. Just make sure whatever you use is well softened first! If you prefer not to use the liquid stevia in the frosting, then substitute 1 teaspoon of this powdered stevia OR 2-3 tablespoons of powdered or granulated sugar. IMPORTANT INSTANT PUDDING MIX NOTE: This is the instant pudding mix that I use. You just need the dry instant pudding mix—don’t prepare it according to the package directions! You may omit it, but you’ll need to increase the liquid stevia (and just mix the ingredients together until incorporated—not for 2 full minutes!). Without the instant pudding mix, the frosting will be a bit runny and may slightly drip down the sides of your cookie bars. 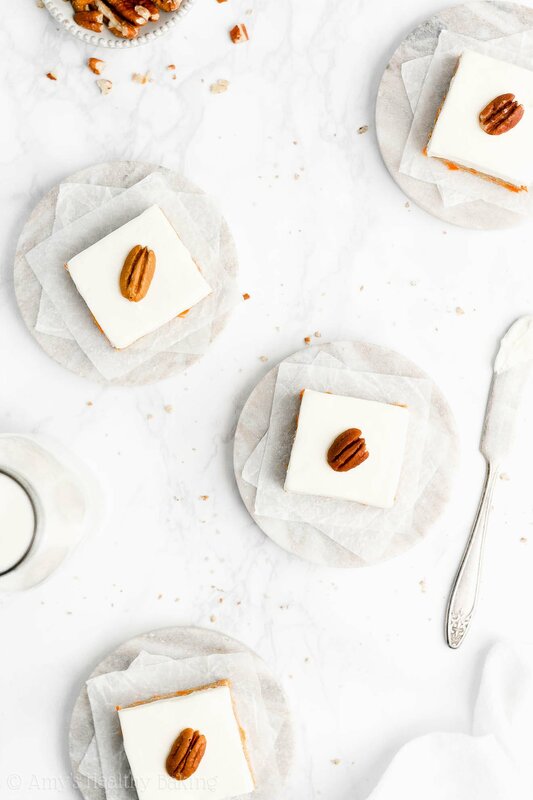 You can also use this cream cheese frosting recipe of mine instead as a clean eating option (no pudding mix required!). 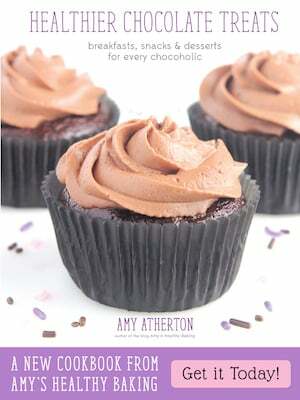 ♡ …and the rest of Amy’s healthy carrot cake recipes!